ICICI Bank has partnered with IRCTC to sell train tickets on its website. The bank said that it will soon introduce the same facility to book train tickets on its mobile app and prepaid digital wallet. Users can search for trains, book tickets, cancel reservations, as well as check their PNR status among others on ICICI’s website. 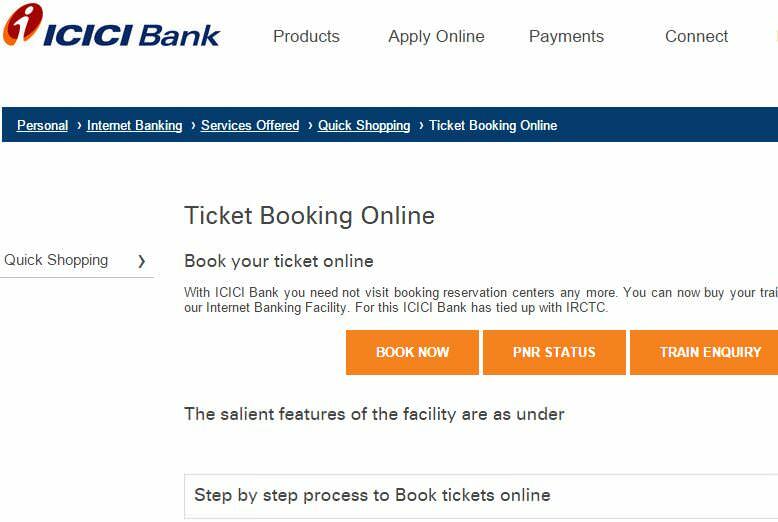 Users will first need to register on IRCTC’s website, and then do a one-time registration on the bank’s website to avail the facility. The facility is not limited to ICICI consumers as users of other banks can also use the service. Users can pay for tickets on ICICI’s website using net banking and debit or credit cards. The website will display the latest info for train options and ticket availability by connecting directly with Indian Railway’s reservation system in real time. This is the first time any bank is offering rail tickets for sale on its website. In the past, IRCTC only partnered with websites which catered to the travel segment.